The NFL is bringing on some new talent. The league plans to hire up to 17 full-time officials before next season, according to the NFL's vice president of football ops, Troy Vincent. 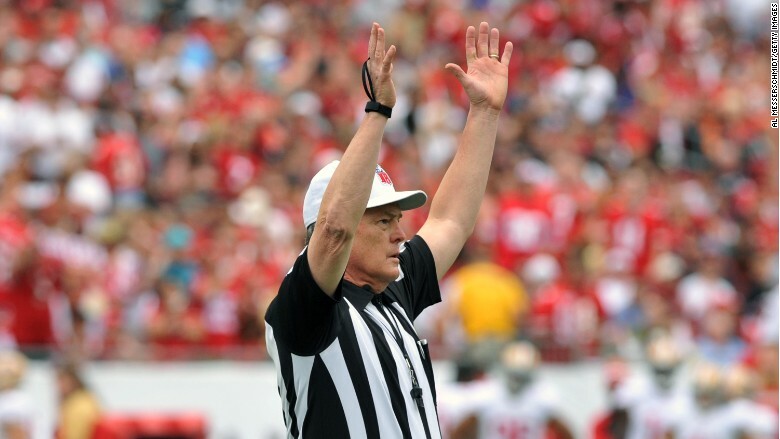 Until now, the NFL has been the only major pro sports league without game officials that work full-time. The news about the hires comes as both coaches and players have complained about missed or incorrect calls by refs. Still, the NFL's part-time officials have an accuracy rate of over 97%. "By this point in the season, everybody's looking for a solution," said Scott Green, who worked as an official for 23 years. "It happens every year, people are upset with calls so they say we should make [officials] full time." While the complaints are nothing new, this is the first time that the NFL has announced plans to hire full-time refs. These new full-time hires will join existing crews of part-time officials as an eighth man on the field. Current part-time officials won't have their status changed to full-time. But before the NFL starts hiring, it needs official approval from the league's Referees Association. Green, who is a retired ref and the association's executive director, said the union is fine with the NFL "using some full-time officials under certain circumstances including equitable compensation, benefits, clearly documented work duties and employee protections." Green calling a touchdown during a game between the San Francisco 49ers and the Tampa Bay Buccaneers. Green retired after the 2013-2014 season. Part-time officials currently make between $75,000 and $200,000 for the season. However, Green noted that terms for the new hires have "yet to be discussed." According to Vincent, hiring full-time officials will make it possible for the NFL to train and work with them in the offseason. Officials are currently off from February after the Super Bowl until April when they have their health physicals. Many current officials argue that they're already working about 40 hours a week, even though it's a part-time job. Green also noted that the NFL schedule is unlike that of other pro sports leagues. "If [teams] played every day during the week, it would make [being full time] more justified," Green said. "But there's only one crew working [the Thursday night game] and 116 officials that aren't." Green worked over 350 games as a ref while running his government contracting firm. He's not alone, many officials balance their NFL jobs with other work as attorneys, insurance agents and even teachers. Green said during the season his schedule was "hectic," as officiating for the NFL was a huge commitment. "You stay pretty active keeping up with the games from the week before and prepping for your next game -- early mornings and late nights," he said. "It's a complete misnomer that we're not full-time. Oh trust me we are." Plus, as Green notes, NBA and NHL referees and MLB umpires work full-time and people still complain about the calls they make.